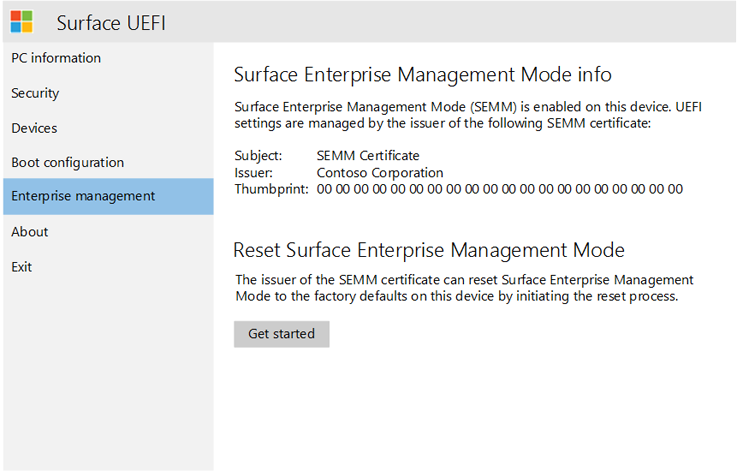 Microsoft Surface Enterprise Management Mode (SEMM) is a feature of Surface devices with Surface UEFI that allows you to secure and manage firmware settings within your organization. With SEMM, IT professionals can prepare configurations of UEFI settings and install them on a Surface device. In addition to the ability to configure UEFI settings, SEMM also uses a certificate to protect the configuration from unauthorized tampering or removal. SEMM is only available on devices with Surface UEFI firmware such as Surface Pro 4 and later, Surface Go, Surface Laptop, Surface Book, and Surface Studio. 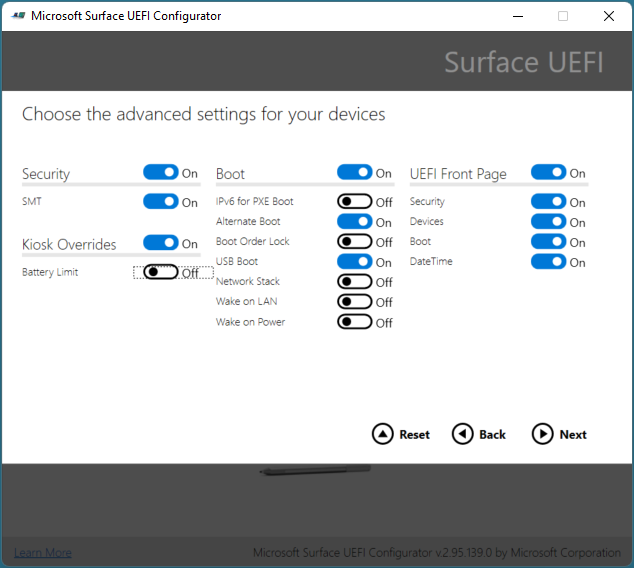 For more information about Surface UEFI, see Manage Surface UEFI Settings. When Surface devices are configured by SEMM and secured with the SEMM certificate, they are considered enrolled in SEMM. When the SEMM certificate is removed and control of UEFI settings is returned to the user of the device, the Surface device is considered unenrolled in SEMM. There are two administrative options you can use to manage SEMM and enrolled Surface devices – a standalone tool or integration with System Center Configuration Manager. The SEMM standalone tool, called the Microsoft Surface UEFI Configurator, is described in this article. For more information about how to manage SEMM with System Center Configuration Manager, see Use System Center Configuration Manager to manage devices with SEMM. The primary workspace of SEMM is Microsoft Surface UEFI Configurator, as shown in Figure 1. 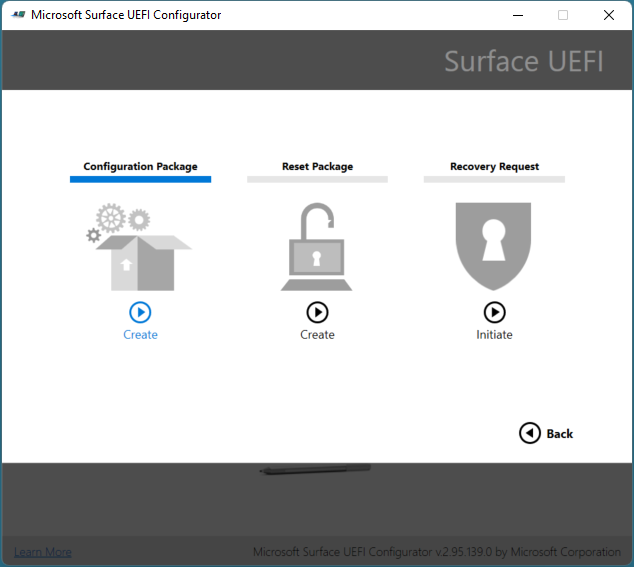 Microsoft Surface UEFI Configurator is a tool that is used to create Windows Installer (.msi) packages or WinPE images that are used to enroll, configure, and unenroll SEMM on a Surface device. These packages contain a configuration file where the settings for UEFI are specified. SEMM packages also contain a certificate that is installed and stored in firmware and used to verify the signature of configuration files before UEFI settings are applied. Surface UEFI Configuration Package. 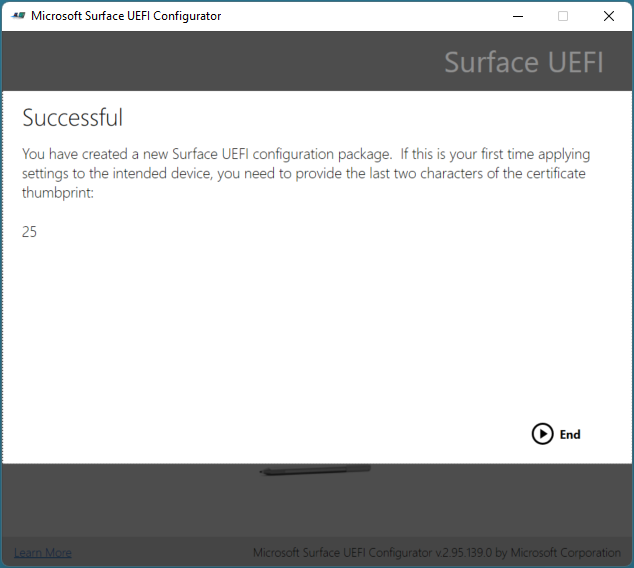 Use this mode to create a Surface UEFI configuration package to enroll a Surface device in SEMM and to configure UEFI settings on enrolled devices. Surface UEFI Reset Package. 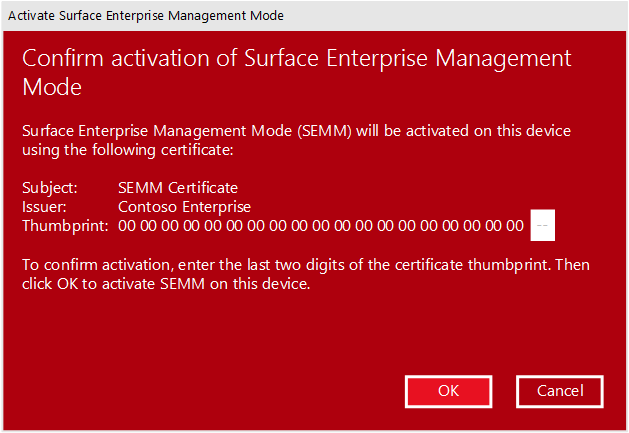 Use this mode to unenroll a Surface device from SEMM. Surface UEFI Recovery Request. Use this mode to respond to a recovery request to unenroll a Surface device from SEMM where a Reset Package operation is not successful. You can download Microsoft Surface UEFI Configurator from the Surface Tools for IT page in the Microsoft Download Center. Surface UEFI configuration packages are the primary mechanism to implement and manage SEMM on Surface devices. These packages contain a configuration file of UEFI settings specified during creation of the package in Microsoft Surface UEFI Configurator and a certificate file, as shown in Figure 2. When a configuration package is run for the first time on a Surface device that is not already enrolled in SEMM, it provisions the certificate file in the device’s firmware and enrolls the device in SEMM. When enrolling a device in SEMM, you will be prompted to confirm the operation by providing the last two digits of the SEMM certificate thumbprint before the certificate file is stored and the enrollment can complete. This confirmation requires that a user be present at the device at the time of enrollment to perform the confirmation. See the Surface Enterprise Management Mode certificate requirements section of this article for more information about the requirements for the SEMM certificate. You can also specify a UEFI password with SEMM that is required to view the Security, Devices, Boot Configuration, or Enterprise Management pages of Surface UEFI. After a device is enrolled in SEMM, the configuration file is read and the settings specified in the file are applied to UEFI. When you run a configuration package on a device that is already enrolled in SEMM, the signature of the configuration file is checked against the certificate that is stored in the device firmware. If the signature does not match, no changes are applied to the device. 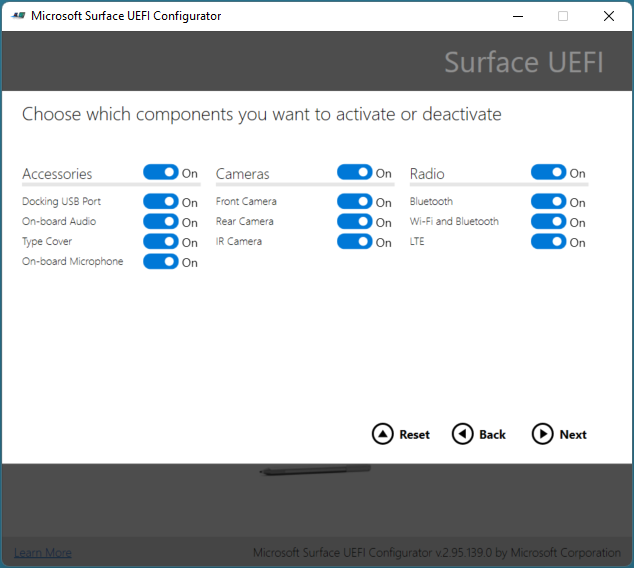 You can use Surface UEFI settings to enable or disable the operation of individual components, such as cameras, wireless communication, or docking USB port (as shown in Figure 3), and configure advanced settings (as shown in Figure 4). When you create a SEMM configuration package, two characters are shown on the Successful page, as shown in Figure 5. These characters are the last two characters of the certificate thumbprint and should be written down or recorded. The characters are required to confirm enrollment in SEMM on a Surface device, as shown in Figure 6. Right-click the .pfx file, and then click Open. Expand the folder in the navigation pane. Right-click your certificate in the main pane, and then click Open. All or Properties Only must be selected in the Show drop-down menu. To enroll a Surface device in SEMM or to apply the UEFI configuration from a configuration package, all you need to do is run the .msi file with administrative privileges on the intended Surface device. You can use application deployment or operating system deployment technologies such as System Center Configuration Manager or the Microsoft Deployment Toolkit. When you enroll a device in SEMM you must be present to confirm the enrollment on the device. User interaction is not required when you apply a configuration to devices that are already enrolled in SEMM. For a step-by-step walkthrough of how to enroll a Surface device in SEMM or apply a Surface UEFI configuration with SEMM, see Enroll and configure Surface devices with SEMM. A Surface UEFI reset package is used to perform only one task — to unenroll a Surface device from SEMM. The reset package contains signed instructions to remove the SEMM certificate from the device’s firmware and to reset UEFI settings to factory default. Like a Surface UEFI configuration package, a reset package must be signed with the same SEMM certificate that is provisioned on the Surface device. When you create a SEMM reset package, you are required to supply the serial number of the Surface device you intend to reset. SEMM reset packages are not universal and are specific to one device. In some scenarios, it may be impossible to use a Surface UEFI reset package. (For example, if Windows becomes unusable on the Surface device.) In these scenarios you can unenroll the Surface device from SEMM through the Enterprise Management page of Surface UEFI (shown in Figure 7) with a Recovery Request operation. When you use the process on the Enterprise Management page to reset SEMM on a Surface device, you are provided with a Reset Request. This Reset Request can be saved as a file to a USB drive, copied as text, or read as a QR Code with a mobile device to be easily emailed or messaged. Use the Microsoft Surface UEFI Configurator Reset Request option to load a Reset Request file or enter the Reset Request text or QR Code. Microsoft Surface UEFI Configurator will generate a verification code that can be entered on the Surface device. If you enter the code on the Surface device and click Restart, the device will be unenrolled from SEMM. A Reset Request expires two hours after it is created. For a step-by-step walkthrough of how to unenroll Surface devices from SEMM, see Unenroll Surface devices from SEMM. The SEMM certificate is required to perform any modification to SEMM or Surface UEFI settings on enrolled Surface devices. If the SEMM certificate is corrupted or lost, SEMM cannot be removed or reset. Manage your SEMM certificate accordingly with an appropriate solution for backup and recovery. It is also recommended that the SEMM certificate be authenticated in a two-tier public key infrastructure (PKI) architecture where the intermediate certification authority (CA) is dedicated to SEMM, enabling certificate revocation. For more information about a two-tier PKI configuration, see Test Lab Guide: Deploying an AD CS Two-Tier PKI Hierarchy. You can use the following PowerShell script to create a self-signed certificate for use in proof-of-concept scenarios. To use this script, copy the following text into Notepad and save the file as a PowerShell script (.ps1). This script creates a certificate with a password of 12345678. The certificate generated by this script is not recommended for production environments. $TestUefiV2 | Export-PfxCertificate -Password $pw -FilePath "Demo Certificate\TempOwner.pfx"
For use with SEMM and Microsoft Surface UEFI Configurator, the certificate must be exported with the private key and with password protection. 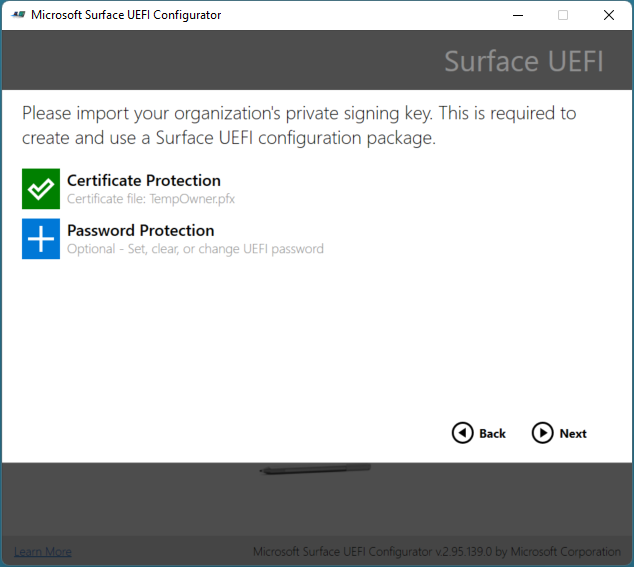 Microsoft Surface UEFI Configurator will prompt you to select the SEMM certificate file (.pfx) and certificate password when it is required. For organizations that use an offline root in their PKI infrastructure, Microsoft Surface UEFI Configurator must be run in an environment connected to the root CA to authenticate the SEMM certificate. The packages generated by Microsoft Surface UEFI Configurator can be transferred as files and therefore can be transferred outside the offline network environment with removable storage, such as a USB stick. The recommended minimum length is 15 months. You can use a certificate that expires in less than 15 months or use a certificate that expires in longer than 15 months. When a certificate expires, it does not automatically renew. Will existing machines continue to apply the bios settings after 15 months? Yes, but only if the package itself was signed when the certificate was valid. Will the SEMM package and certificate need to be updated on all machines that have it? If you want SEMM reset or recovery to work, the certificate needs to be valid and not expired. You can use the current valid ownership certificate to sign a package that updates to a new certificate for ownership. You do not need to create a reset package. Can bulk reset packages be created for each surface that we order? Can one be built that resets all machines in our environment? The PowerShell samples that create a config package for a specific device type can also be used to create a reset package that is serial-number independent. If the certificate is still valid, you can create a reset package using PowerShell to reset SEMM.